SAP S/4 HANA Cloud a next-generation ERP. It integrates all the know-how of the SAP Experts and innovates in the analytics field with real-time management in the cloud. Designed for groups and large organizations that want to switch to the cloud, SAP S/4 HANA Cloud builds your system landscape around a powerful and intelligent ERP. SAP S/4 HANA Cloud is a Cloud ERP with a foundation focused on the following areas: Finance, Sourcing and Purchasing, Human Resources and Sales. 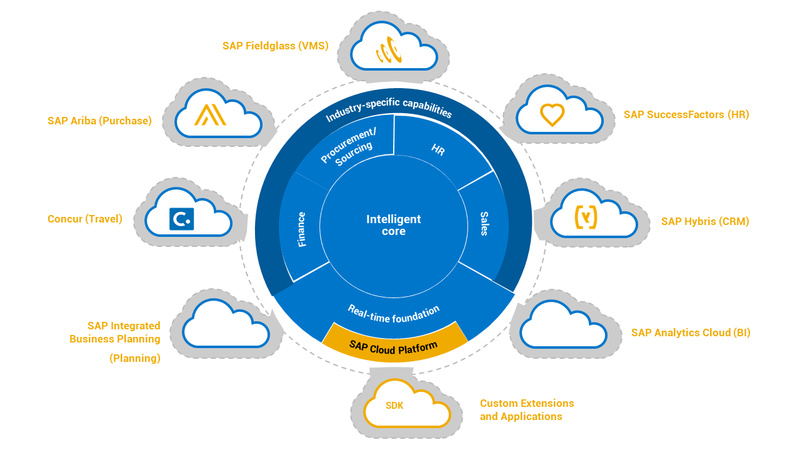 As an intelligent suite, this solution integrates a complete landscape of vertical business solutions such as customer and supplier relationship management solutions as well as the SAP Cloud Development Platform (SDK) for designing solutions dedicated to your business. The deployment of the solution is done thanks to an innovative deployment methodology and a complete set of scenarios taking up the best practices of the industry. Our teams accompany you to determine the ideal scope to ensure the success of the implementation and makes the most of the solution. SAP S/4 HANA cloud is an ERP in SaaS (Software as a Service). SAP S/4 HANA Cloud is Intelligent ERP that enables your business to benefit from a powerful predictive analytics tool, machine learning, and digital control to speed decision-making, improve performance, and improve productivity and make users more autonomous. Instantly visualize every aspect of your business, access your data in real time and clearly distinguish your future through predictive analytics. Access new generation innovations to eliminate repetitive, low value-added actions and identify activities requiring your attention and intervention. SAP CoPilot leverages integrated machine learning to work with you as a co-pilot. It sends notifications and reminders to speed up and facilitate your actions. SAP S/4 HANA Cloud helps your organization adapt to rapid changes. It provides you with access to the latest technologies, providing agile and flexible tools to track changes in your environment. An upgrade is planned every quarter. Your enterprise is always at the forefront of technology. With SAP S/4 HANA Cloud SDK and SAP Cloud Platform, easily extend the scope of your ERP with vertical solutions and/or developing your own applications. The deployment of the solution is done through an agile deployment methodology by following the best practices of the industry.